Robert’s research revealed the home’s history. It was built by William McMillan, an undertaker who first used the home briefly to operate a funeral parlor. “He was an interesting guy,” Robert said, showing evidence of a body elevator from the main floor into the basement. The house sold to a family in 1913 and has since housed the living. Previous owner Jim Scheirbeck built the unusual rock wall surrounding the property. The 4,200-square-foot house sits on a double, 8,000-square-foot corner lot near Alberta Street, valuable property for a developer. Given Portland’s current growth, the house was likely to be replaced with much more dense housing. Instead, the house was purchased by the Guinns with financing, no property disclosures and no ability to get a home inspection or even see important interior details due to a hoarding situation. He also is willing to share what he calls a dirty secret. “It will look more like a Victorian than ever,” Robert said, admiring the old, ornate exterior. “The interior will be a more modern and open concept as none of the original trim or details remained,” Robert explained, touring the gutted interior. 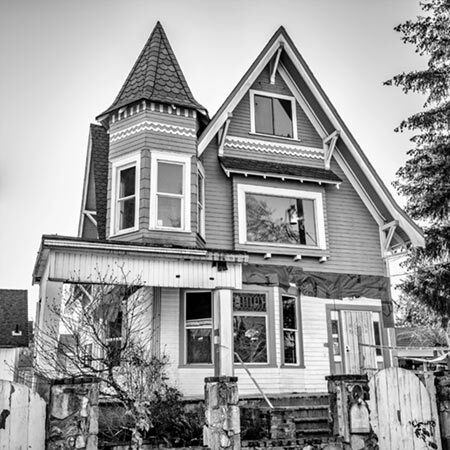 “We hope to use local artists and makers for the home’s finishing work – eclectic inside, Victorian outside. “When we began our housing search, we were looking for an interesting home in the neighborhood we love,” he said. They already rent a house in Concordia, just a few blocks away. The couple never thought restoring the Going Queen would become such a massive project. Construction began in December, starting with structural work to rebuild the foundation, and they hope for all work to be completed in August. The blog Robert writes detailing this labor of love is at TheGoingQueen.com. « Thanks For Asking – Have an inquisitive cross-cultural question?